Today I’m here to tell you a story about two dogs. The first one is white and the second one is black. My daughter, my wife and me love them. We usually played together with them. Dream and Win were friendly. They were very happy and certainly we were happy too. Suddenly one day, my friend came to see my family after 20 years. We talked together and we had a lunch together. My friend saw the black dog and he liked the black dog very much. I always want my friend to have many happy and I gave him a black dog. I was very happy and my friend was happy too but Dream and Win were not happy. After the day The white dog is not good, he does not eat anything, he only sleep all day. 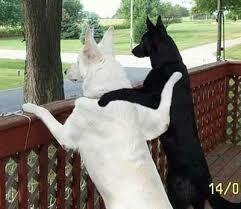 ..and my friend called me to tell a story about the black dog. oh oh I and everyone can’t say what that happens like that. We were very sad and my friend gave again me the black dog. Dream and Win were very fun and they played together, eat together, and slept together. My family thanks a friend very much. Of course two dogs are very happy too. Today I want to say with you: I never do it like that.